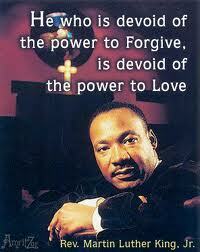 Dr. Martin Luther King, Jr. was a preacher. Martin fought for Civil Rights for all Americans. Martin had a Dream. He told Americans about his dream. Martin was shot and killed. Dr. King's dream lives on. Links to Martin Luther King, Jr.
Color Dr. Martin Luther King Jr.
Dr. King was born in Georgia in 1929. When Martin was growing up there were segregation laws in the South. Segregation laws said that African Americans had to go to separate schools, use separate bathrooms and drinking fountains, and they always had to sit in the back of the bus. Martin studied hard in school and went to college in Georgia . Martin wanted to learn more. He went to college in Pennsylvania and then in Boston . These colleges were in the North. States in the North didn't have segregation laws. 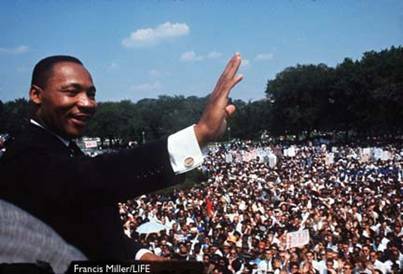 Martin earned his Ph.D. and was called Dr. King. Martin met Coretta in Boston and they were married. They had four children. Martin felt that the laws in the South were unjust. He studied great people who knew how to change unjust laws. 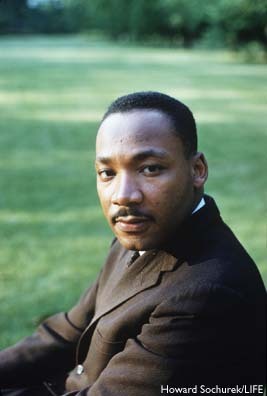 Martin began to speak to Americans about the unjust segregation laws. Some Americans were prejudiced against African-Americans. Martin and Coretta wanted to stay in the North where there were no segregation laws. But Martin felt he needed to help Americans and African-Americans in the South. Martin and Coretta moved back to Georgia and Martin became a preacher in Atlanta . Dr. King helped African Americans protest the unjust segregation laws. The more he talked, the more Americans began to listen. 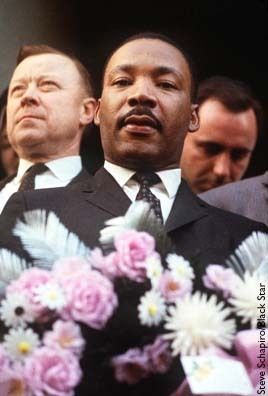 Dr. King made many speeches about peace and love. He wanted each American to be treated with dignity and respect. He wanted all Americans to have equality and justice. In 1964 he was given the Nobel Peace Prize by the whole world for his wisdom and words. 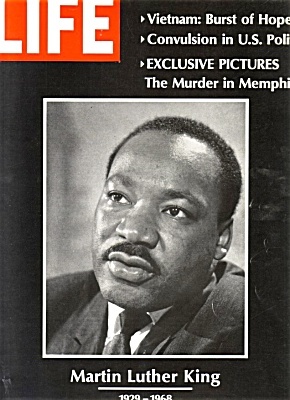 Dr. King was shot and killed in Memphis, Tennessee in 1968. Dr. King's death didn't stop his words from helping Americans to learn peace and respect. Today there are no segregation laws in the United States . Americans now honor the African-Americans who do great things by studying Black History every February. Page created February 25, 2002. Anne Pemberton. Updated Wed, Apr 4, 2012. AP.